I really liked my Fitbit yesterday, because it showed that I had reached 6,500 steps after my morning run. I really despised my Fitbit this morning when I checked post-run and saw that it didn't record a single step. What a waste of exercise. The saving grace is that my Garmin captured my run and, using the SPM metric and elapsed running time, I estimated that I ran about 6,400 steps. My Fitbit will never know this. Adding insult to injury, I expect the Fitbit to put a message on the display tonight shaming me for moving so little today. After eight straight runs over my vacation break, I had a long layoff. My return to the office resulted in no running until yesterday. I was able to determine that my average step count during a work day is about 5,500 and I've been adding about 5,000 more when I got home. If I can't fit in runs Monday through Thursday, I need to generate more steps at work. I've been using a stand up desk in my office for the last year and that's better than sitting, but it's impolite to stand during meetings and worse to pace around the conference table. The weather this week has been cold and rainy. Yesterday I stayed inside and used the treadmill. As I ran, I thought about how much I dislike the treadmill experience. I tried to think about the positives - the softer surface, no wind resistance (except for the fan), no broken pavement, no cars, and no hills. I had the TV to distract me and I could just set my pace and zone out. Unfortunately, it doesn't quite work that way for me. I usually turn off the TV after a few minutes because it starts to annoy me. The lack of true forward progress feels futile. My only thought is that every step gets me incrementally closer to finishing. This morning started with rain, but I had to bring my son to the high school and wouldn't have been able to run before then anyway. By 9:00 AM the skies had cleared, and I got outside for a neighborhood run. There was a lot going on for us, so I wasn't able to cover that much distance. I appreciated the cool air and the cloudy skies. My run almost felt automatic. It was as if I was riding along, rather than doing any work. While my son was getting through his SAT and I was running through my neighborhood, my wife and daughter were at Citi Field participating in the Color Run. 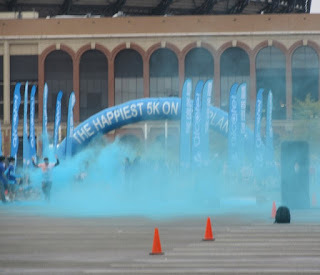 This is a non-competitive run where participants get sprayed with colored corn starch along the way. The "race" starts in the corridors under the ball park and winds through the playing field and then around the stadium area. It was a fun pre-Mother's Day activity and definitely more fun than taking the SATs. Tomorrow is officially Mother's Day so I'll need to get out early. I hope the rain will stay away long enough for me to get a few miles in. The color run sounds like such a fun experience! Mrs. ER should blog about it. Of course, your treadmill experience sounded fun, too. No really. I wouldn't just say that to make you feel better. I think Mrs. ER should blog about it too! They had a great time and said that it was more like a party than a race - everyone was friendly and no one cared about their time. Although my opinion of treadmills remains low, I'd admit that I enjoyed the run I did with you at Life Time a few weeks ago. That was actually fun! ER jr amazes me because he spent most of Friday taking the AP History exam and then half of his Saturday taking the SATs. I'm confident that he did better testing than I did running.